FARMINGTON, Del. 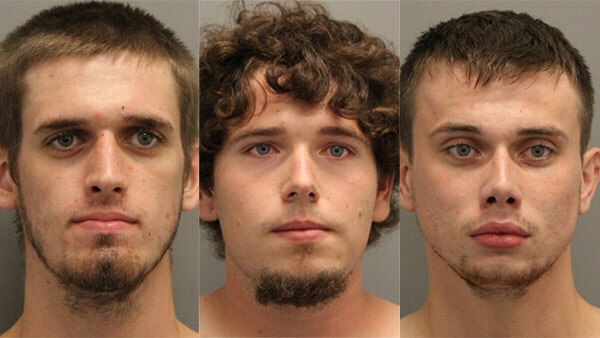 (WPVI) -- Delaware State Police have arrested three men Kent County in connection to a meth lab operation. Troopers responded to the 2000 block of Hickman Road in Farmington for the report of people manufacturing methamphetamine in a trailer behind a home. Upon arrival, troopers saw equipment and component mixtures of the manufacturing stages of meth and detected a strong odor of ammonia. When the troopers approached the three suspects in the trailer, they noticed an active "one-pot" on the floor. At that time, the suspects were detained and the Kent County Drug Unit was contacted. Authorities soon confirmed that a "one-pot" meth manufacturing lab was taking place on the property. After a consent to search was obtained, authorities collected and seized components used to manufacture meth along with key ingredients in making the drug. Brian W. Holben, 21 of Farmington, Hunter C. Stockman, 22 of Bridgeville and Lathan Verry, 21 of Greenwood were arrested and charged with Operating a Clandestine Laboratory and Conspiracy 2nd Degree. The suspects were committed to James T. Vaugh Correctional Center in default of $6,000 secured bond. Hickman Road was closed for approximately three hours until the scene was deemed safe.